Humanity has visited Uranus only once, and that was 30 years ago. NASA's Voyager 2 spacecraft got its closest look at the mysterious, distant, gaseous planet on Jan. 24, 1986. Voyager 2 sent back stunning images of the planet and its moons during the flyby, which allowed for about 5.5 hours of close study. 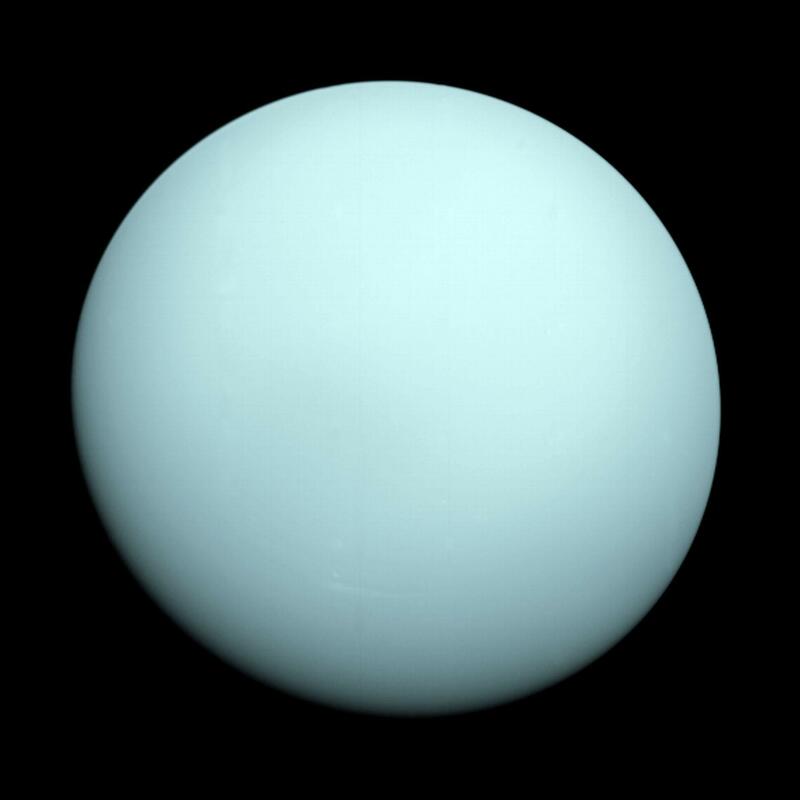 The spacecraft got within 50,600 miles (81,500 kilometers) of Uranus during that time. "We knew Uranus would be different because it's tipped on its side, and we expected surprises," said Ed Stone, project scientist for the Voyager mission, based at the California Institute of Technology, Pasadena. Stone has served as project scientist since 1972, continuing in that role today. Uranus revealed itself to be the coldest planet known in our solar system, even though it's not the farthest from the sun. This is because it has no internal heat source. Scientists determined that the atmosphere of Uranus is 85 percent hydrogen and 15 percent helium. There was also evidence of a boiling ocean about 500 miles (800 kilometers) below the cloud tops. Scientists found that Uranus has a magnetic field different from any they had ever encountered previously. At Mercury, Earth, Jupiter and Saturn, the magnetic field is aligned approximately with the rotational axis. "Then we got to Uranus and saw that the poles were closer to the equator," Stone said. "Neptune turned out to be similar. The magnetic field was not quite centered with the center of the planet." This surface magnetic field of Uranus was also stronger than that of Saturn. Data from Voyager 2 helped scientists determine that the magnetic tail of Uranus twists into a helix stretching 6 million miles (10 million kilometers) in the direction pointed away from the sun. Understanding how planetary magnetic fields interact with the sun is a key part of NASA’s goal to understand the very nature of space. Not only does studying the sun-planet connection provide information useful for space travel, but it helps shed light on the origins of planets and their potential for harboring life. Voyager 2 also discovered 10 new moons (there are 27 total) and two new rings at the planet, which also proved fascinating. An icy moon called Miranda revealed a peculiar, varied landscape and evidence of active geologic activity in the past. While only about 300 miles (500 kilometers) in diameter, this small object boasts giant canyons that could be up to 12 times as deep as the Grand Canyon in Arizona. Miranda also has three unique features called "coronae," which are lightly cratered collections of ridges and valleys. Scientists think this moon could have been shattered and then reassembled. Mission planners designed Voyager 2's Uranus encounter so that the spacecraft would receive a gravity assist to help it reach Neptune. In 1989, Voyager 2 added Neptune to its resume of first-ever looks. "The Uranus encounter was very exciting for me," said Suzanne Dodd, project manager for Voyager, based at NASA's Jet Propulsion Laboratory, Pasadena, California, who began her career with the mission while Voyager 2 was en route to Uranus." It was my first planetary encounter and it was of a planet humanity had never seen up close before. 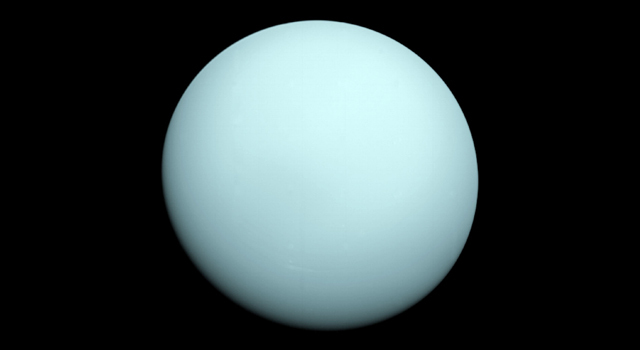 Every new image showed more details of Uranus, and it had lots of surprises for the scientists. I hope another spacecraft will be sent to explore Uranus, to explore the planet in more detail, in my lifetime." Voyager 2 was launched on Aug. 20, 1977, 16 days before its twin, Voyager 1. In August 2012, Voyager 1 made history as the first spacecraft to enter interstellar space, crossing the boundary encompassing our solar system's planets, sun and solar wind. Voyager 2 is also expected to reach interstellar space within the next several years. The Voyagers were built by JPL, which continues to operate both spacecraft. JPL is a division of Caltech.